Having turned 60 last month, Lyle’s exemption as a former Open Champion ends this year at Carnoustie, barring an unlikely top-10 finish. But while he gears up for an Open farewell in Scotland, the lure of teeing it up as a former Masters winner remains strong. Augusta National does not limit the appearances of its past champions, meaning it will be down to Sandy to decide when to call it a day. “It’s not something where you can say: ‘I will play two more years and then finish’,” admits the big Scot. “Two years ago, Ian Woosnam said after his second round: ‘I’m done with The Masters’. “Then Woosie started playing a bit better. He put that thought to one side and played last year and is playing again this year. “As a player, you know yourself if the course is getting too long or it’s impossible to break 80. Then you know it’s time. “If your game goes, it’s time to walk away and let someone else have your spot. “But I still feel that I am hitting the ball long enough, so I can easily manage a couple more years. But you never know. 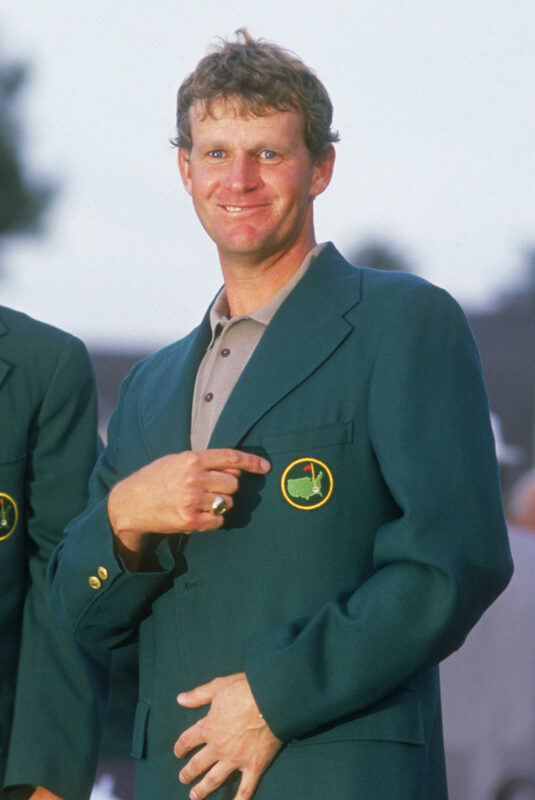 Every trip to The Masters is special, but this year marks the 30th anniversary of Lyle’s historic triumph. Sandy jokingly insists that makes him feel old when he reflects on that magic Sunday afternoon in 1988 when he became the first British winner. But the memories are etched indelibly on his mind, and of those who watched. 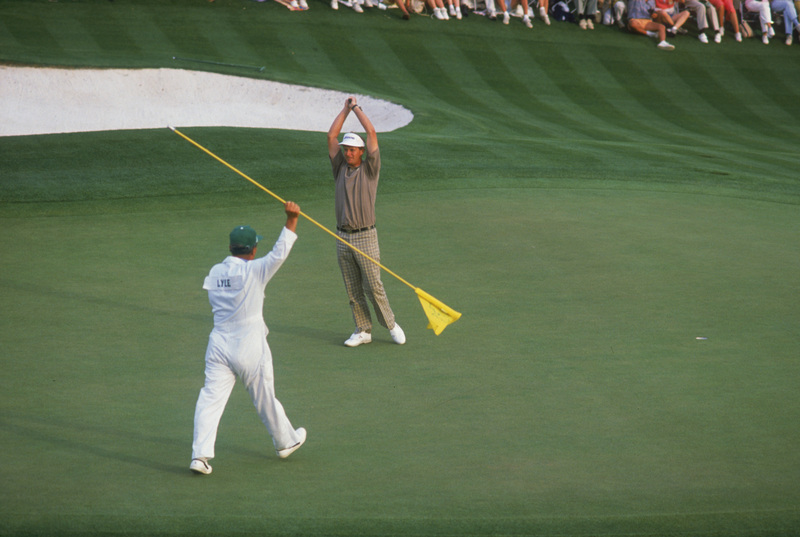 His famous bunker shot at the final hole is one of the iconic Augusta moments – worthy of comparison with Tiger Woods’ chip-in on 16 in 2005 and Jack Nicklaus’ putt at the 17th in 1986. Even 30 years on, the man himself knows what an impact that shot made. “I get reminded about it at pro-ams nearly every week,” he smiles. “People’s memories are still very clear of the bunker shot and my win. “I get a real buzz out of it. It’s great to be known for such an iconic finish. “At the time, I had no idea what sort of impact it would have. The gas tank was empty and the adrenaline was wearing off. It was a case of trying to survive the rollercoaster that is the back nine. 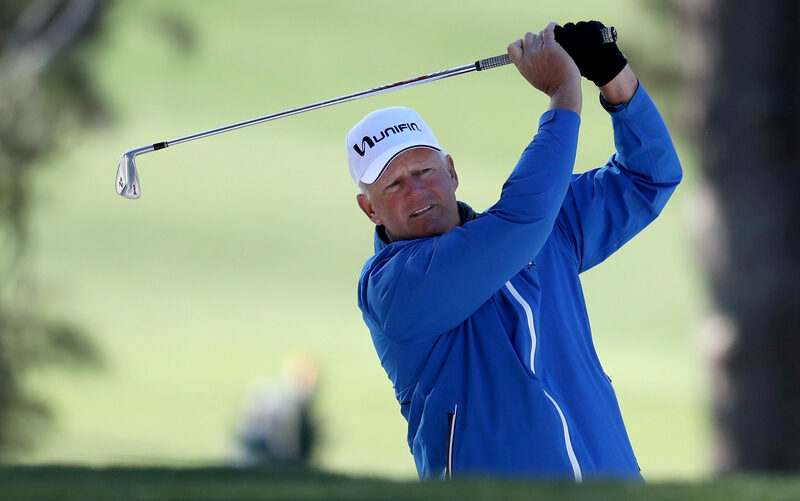 “I bogeyed 11 and had a double-bogey at 12. But I birdied 16, which was unexpected and then to birdie 18, after going in the bunker, was even more unexpected. “When the last putt went in, I could have just melted into a blob on the green! “The pressure of trying to stay alive in that tournament drained away from my head and shoulders. “But what a moment, one I’ll always cherish. “It was late in the evening at Augusta and gone midnight back in Scotland, where everyone was on the edge of their seat. “When I went into the bunker, I’m sure they all thought: ‘So near yet so far’ and that I was going to lose with a bogey at the last. The Masters is eagerly anticipated each year. But with Tiger Woods and Phil Mickelson on the comeback trail and Rory McIlroy and the rest of the modern stars in blistering form, Sandy is expecting fireworks. “It’s all brewing up into quite a frenzy,” he admits. “With Tiger Woods coming back, the TV ratings are doubling and tripling. “There are so many potential first-time winners of The Masters. Then there are Augusta regulars like Tiger and Phil. “It should make for a great event. But it doesn’t properly get going until the back nine on Sunday. You jostle for position for three-and-a-half days. “You get into position and then the heat is really on. Especially around Amen Corner.